We've all been there - the mad panic of realising you've overslept and have a matter of seconds to get to work. 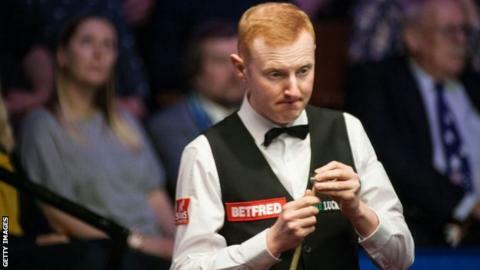 Anthony McGill suffered that sinking feeling at the China Open, waking up only two minutes before the start of a match - despite the 2.30pm start time. "I woke up during the night, practised for two hours then went back to bed at 7am," the 28-year-old Scot said. "The next thing I knew, my phone was vibrating. It was 2.28pm. It was (tournament director) Martin Clark ringing me. "I got dressed in 60 seconds and ran down to the hotel foyer. I didn't even have a shower or brush my teeth. My shoelaces were still untied, it was like a movie scene." Unsurprisingly, McGill arrived a little late for the first round match against Nigel Bond and was docked a frame, but he composed himself to compile a break of 77 to level at 1-1. He slipped 3-1 behind but hit back to win five of the next six frames with breaks of 133, 100, 86 and 61. McGill will face Stephen Maguire or Xu Si in the next round, presumably after a good night's sleep. And a shower.